Andre Hobbs, M.D. is fellowship-trained in interventional pain medicine and specializes in diagnosing and treating pain related to a variety of injuries and medical conditions. He is board certified in the field of physical medicine and rehabilitation as well as pain medicine. Dr. Hobbs uses advanced imaging and other tools to pin point the source of pain and treat it using a multitude of advanced non-surgical techniques. Dr. Hobbs takes a multidisciplinary approach to evaluating his patients and works collaboratively with our advanced imaging department and radiologists, physical therapists, chiropractors and when conservative means fail, orthopedic and neurosurgeons. Dr. Hobbs recognizes pain is a complicated, often debilitating problem that can have a major impact on a patient’s physical and mental well-being. He therefore has a thorough and individualized approach to diagnosing his patients and offers a comprehensive range of services for patients suffering from acute or chronic pain. Dr. Hobbs employs the use of numerous procedures for pain management such as interventional pain procedures epidural injections, facet and other nerve blocks, Botox injections for muscle spasms/torticillis, radio frequency ablations (rhizotomy), implantable pumps and spinal cord stimulators. 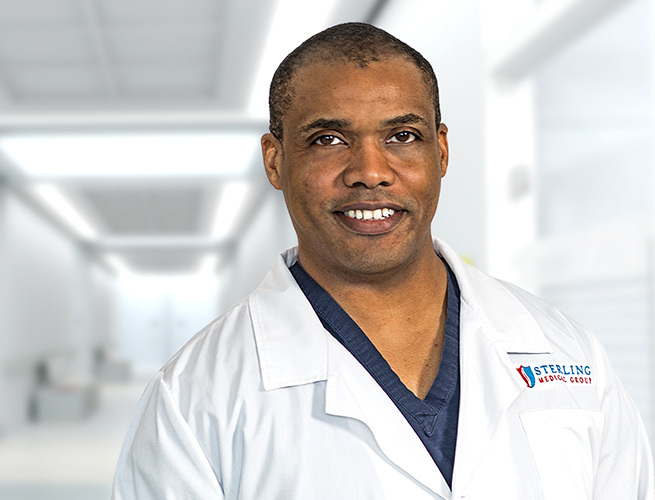 Dr Hobbs is a graduate from the University of Illinois with honors and received his doctorate from the University Of Illinois College of Medicine. He completed his residency in Physical Medicine & Rehabilitation at Temple University in Philadelphia, Pennsylvania. Dr. Hobbs then completed fellowship training in Interventional Pain Medicine at Emory University in the Georgia Pain Physicians Program. Dr. Hobbs eliminates or controls pain, restores function, and helps his patients return to a quality lifestyle. He has a personable approach for managing each patient using the most advanced treatment options in a supportive, compassionate environment. His personal interest include sports & recreational activities, comedy, travel, & youth enrichment. How can we help you? Tell us the best way to reach you and a Sterling Medical Group representative will contact you. By clicking "Send Request" you agree to authorize Sterling Medical Group to contact you at the telephone or email you have provided above for purposes of servicing this inquiry.